Fine Cooking App is a free cooking app for Windows 8 wherein, users can learn to make a different types of delicious recipes in just a few minutes. The app brings you the main ingredients required and the method of cooking the selected dish. In addition, this cooking app for Windows 8 delivers various recipes of healthy cooking. The good part is that it each recipe is being delivered in a high-resolution screen which makes it easier for you to read and understand how to cook a particular dish. This Windows 8 app brings you various options like thumbnail, full screen mode, zoom, and images. Comes up with ingredients, method of cooking. Offers various helpful options like thumbnail, zoom, images, text and the like. Lets you continue reading the half unread recipes. Offers high-resolution text with picture clarity. 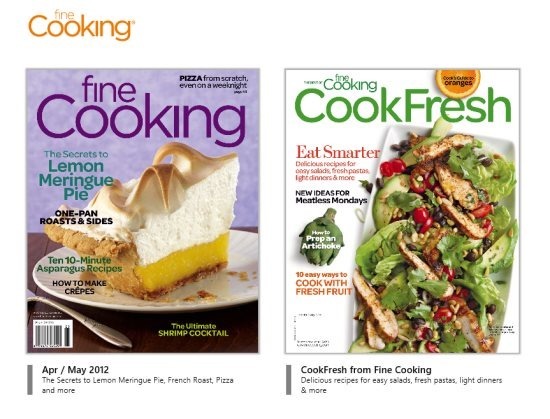 Fine Cooking App for Windows 8 has been made two basic categories — Cook Fresh and Fine Cooking. Each category has hundreds of different delicious recipes in it. Another feature that I liked about this app for Windows 8 is that it resumes the recipe from where you had left closed. However, you need to click on “Continue Reading” option in order to look for unread recipes. Moreover, some of the cooking apps come up with a detail information such as name of director,advertising senior, vice president, address, contact number, email id, different sites to get help with online member services and to get the other products of Fine Cooking App. However, one thing I found missing in this Windows 8 app is that it does not provide a search bar which actually made me to go through the entire thumbnail screen to look for the required one. Moreover, the downloading process to get into the recipe book is quite long. Nevertheless, once you are done with this downloading process, the app id worth having it due to the delicious yet healthy recipes it gives. Do not miss out our post on Drawing App For Windows 8. In short, Fine Cooking App for Windows 8 is a good utility app designed for those who love to experiment upon new dishes each day. Go ahead and try this Windows 8 Cooking available under the “Food and Dining ” category in Windows 8 App Store.